The marketisation of higher education is a growing worldwide trend. Increasingly, market steering is replacing or supplementing government steering. Tuition fees are being introduced or increased, usually at the expense of state grants to institutions. Grants for student support are being replaced or supplemented by loans. Commercial rankings and league tables to guide student choice are proliferating with institutions devoting increasing resources to marketing, branding and customer service. The UK is a particularly good example of this, not only because it is a country where marketisation has arguably proceeded furthest, but also because of the variations that exist as Scotland, Wales and Northern Ireland increasingly diverge from England. He shows how the evaluation and funding of research, the funding of student education, quality assurance, and the structure of the system have increasingly been organised on market or quasi-market lines. 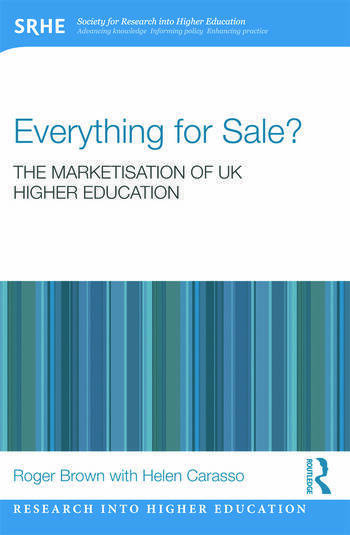 As well as helping to explain the evolution of British higher education over the past thirty years, the book contains some important messages about the consequences of introducing or extending market competition in universities’ core activities of teaching and research. This timely and comprehensive book is essential reading for all academics at University level and anyone involved in Higher Education policy. Roger Brown is Professor of Higher Education Policy at Liverpool Hope University, UK.